music, tuesday's tunes, what are you listening to? Happy Tuesday, loves! I hope you all are doing well and that your week is off to a great start so far! It's been a while since I've shared a playlist here on the blog with you guys. And I noticed I haven't done a Tuesday's Tunes installment in a long time, either. So I decided to give you all a taste of the songs I've been listening to today and receiving great vibes from. And trust me, they are all feel-good songs. I hope you enjoy! It's quite apparent I'm an Andre 3000 stan. And this could arguably be one of my favorite songs of his as a solo artist (though this was a double-disc effort from Outkast). It's so fun, upbeat, and unlike anything else that was playing on the radio at that time. It's another one of those "cotton candy on a summer day" type of songs for me. I smile with great memories each time I hear it. And don't put the video on. You would think I was one of the girls in the American Bandstand-ish audience, too! While I'm no fan of Odd Future, there's something about Syd the Kid's voice that is so mesmerizing to me. It's so enchanting, soft, and sweet. And the dope production by Chad Hugo (of the Neptunes) totally seals the deal on this track. I'm not ashamed to admit I've listened to this song on repeat for the last couple of months. Isn't it so infectious, though? Something about this song always puts a swing in my step and a drop of sweetness in my stride! It's like indulging in the good old days I never got the chance to witness personally. I love the way Raphael Saadiq adds the Motown funk sound to this track. This is one of the songs I listen to when I'm up getting dressed and it instantly puts me in a good mood. 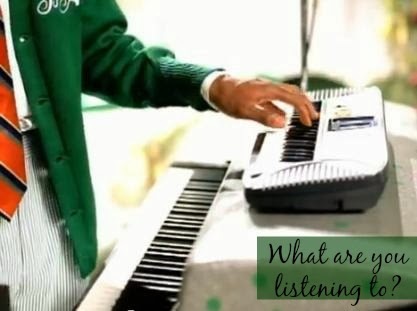 Are you a fan of Raphael Saadiq? What is he up to these days? Jennifer Hudson did it with this one! I love everything about this song--from Jennifer's soulful voice, the vocal arrangements, the lyrics, the T.I. feature, down to the disco elements of the track. Doesn't it remind you of something Chaka Khan or Evelyn "Champagne" King would have done in the 80s? It just makes me want to get up and do my two-step shimmy! There was no way I could mention Jennifer Hudson's single without noting the song it sampled from. "I'm In Love" is a song that makes you want to get up and dance! When listening to this song and getting into the groove, I always wonder what my mom and dad were like during the early 80s and how they used to "get down" at the parties. I could see my mom now! What are some feel-good songs that lift your spirits? Please share them with me in the comments!